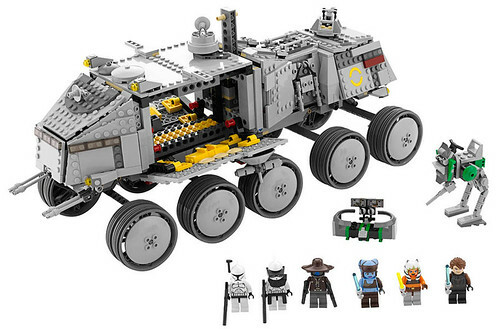 Wired Magazine is running a story on new Star Wars toys, including a couple of LEGO sets. They’ve got two large photos, one of 8089 Hoth Wampa Cave which has around 300 pieces, and is set in the classic Star Wars universe, and the other is the 8098 Clone Turbo Tank with over 1,100 pieces (pictured above), set during the Clone Wars (the Cartoon Network series). The Hoth Wampa Cave features Luke Skywalker, Zev Sensca, and Wampa minifigs, and the Clone Turbo Tank features Anakin Skywalker (everybody could use another one of those, right? ), Cad Bane, Ayla Secura, Ahsoka Tano, and some clone troopers and a droid. 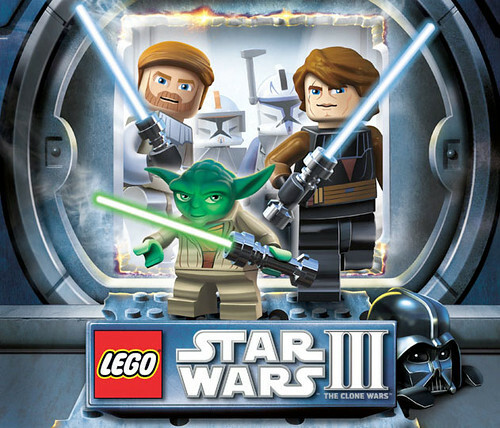 LucasArts and TT Games (Traveller’s Tales) announced LEGO Star Wars III: The Clone Wars yesterday. It’s the same group that was behind the LEGO Star Wars and Indiana Jones games. It’ll be available later this year (Fall 2010) on the Nintendo Wii, Nintendo DS, Playstation 3, Playstation Portable (PSP), Microsoft Xbox 360, and Microsoft Windows. There are going to be new battle and head-to-head modes, an “upgraded level building” that allows for making customized bases (out of LEGO pieces). There are new movements and roles as well. The press release mentions they’ve sold over 20 million units in the LEGO Star Wars series.